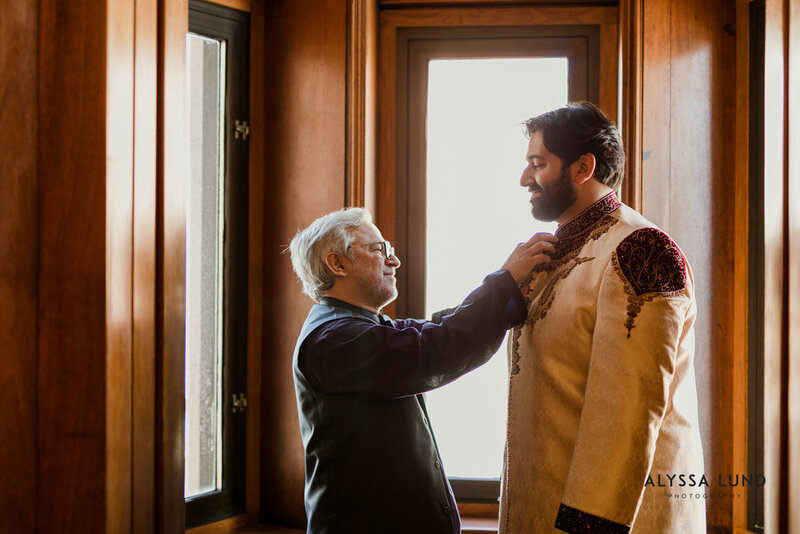 The most emotional, striking memories I’ll take with me from Nadia and Sal’s wedding were the high energy moments when their family and friends surrounded them in swirls of love. 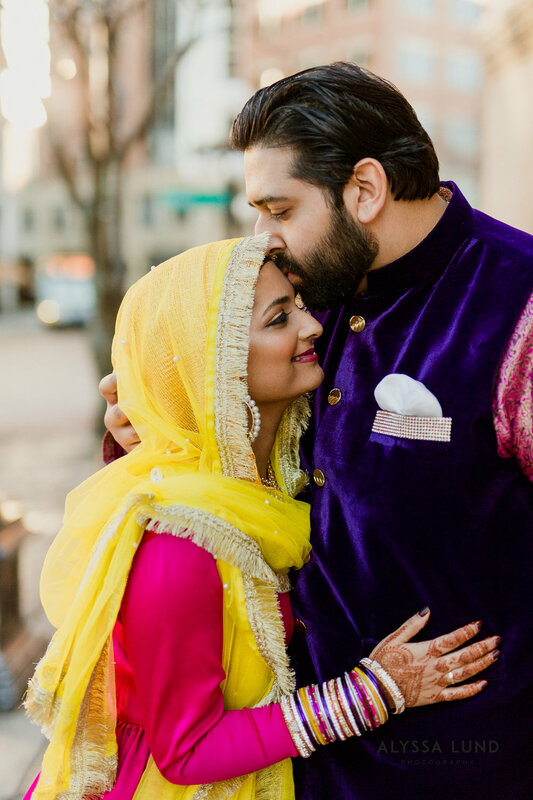 Their celebrations began and ended with these bustling, loving crowds of everyone together; these moments had a vibrance and richness that I loved documenting. 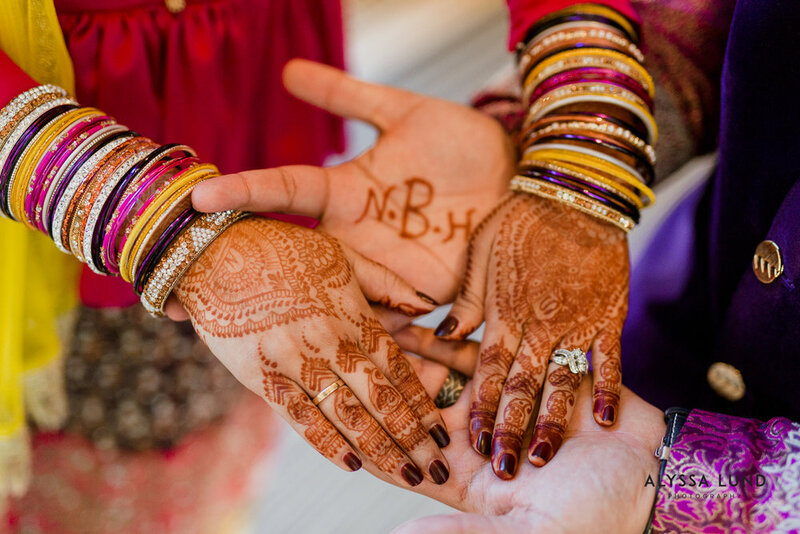 Nadia and Sal’s Nikkah ceremony took place on Friday with their families and a few very close friends. As Nadia arrived at Masjid-Ar-Rahman she was whisked into a chair. Each aunt, cousin, and friend shared a hug and moment with her. Some really lovely energy and connection filled the mosque as everyone arrived. My second photographer and partner, Tyler, and I focused on documentary pictures during the ceremony, which was very calm and almost serene. 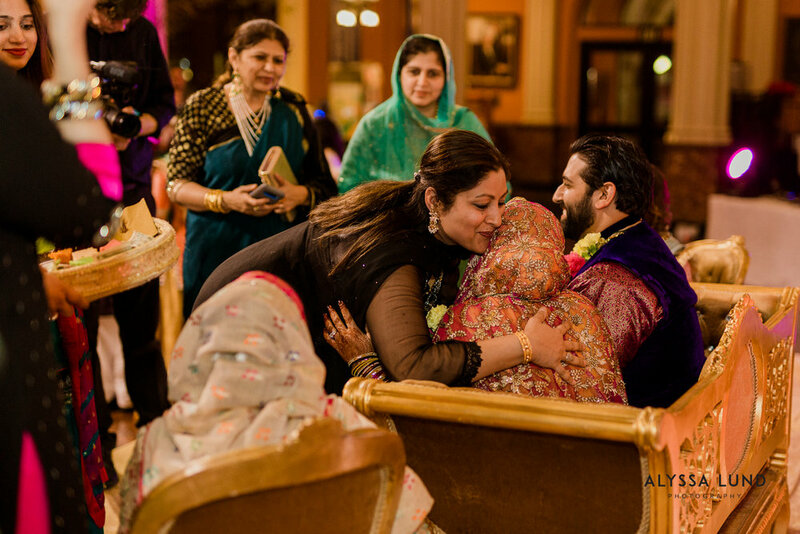 When the ceremony ended, parents put garlands on Nadia and Sal,fed them sweets, and again there was an abundance of hugging and excitement with family and friends taking pictures together. 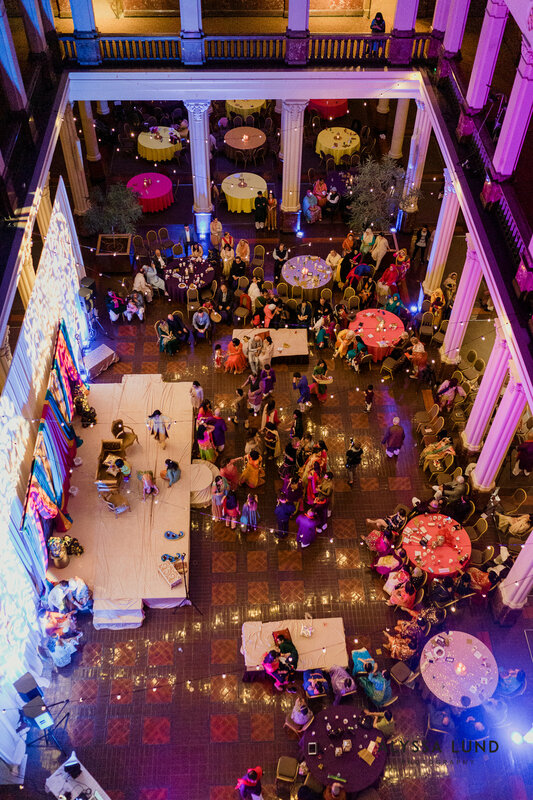 After a break in the festivities we reconvened later in the day for their Mehndi celebration at the Landmark Center in St. Paul. 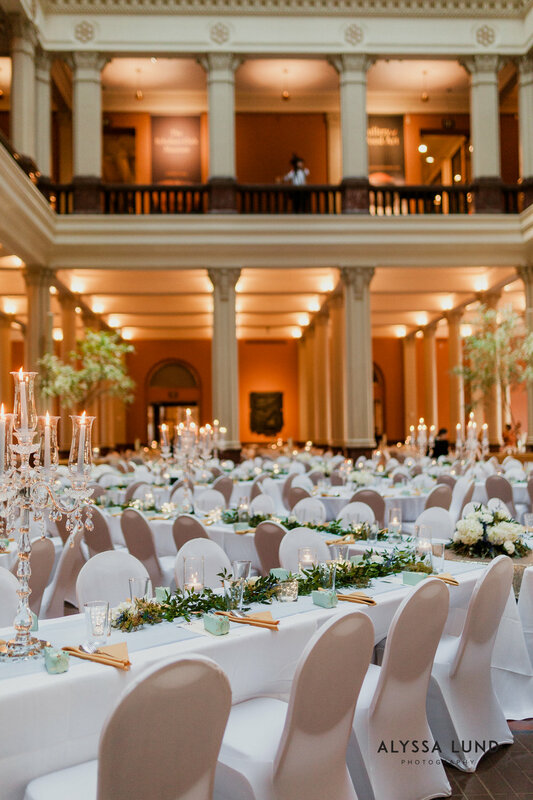 The architecture there is classic and elegant, and the space was decked out in bright colors. 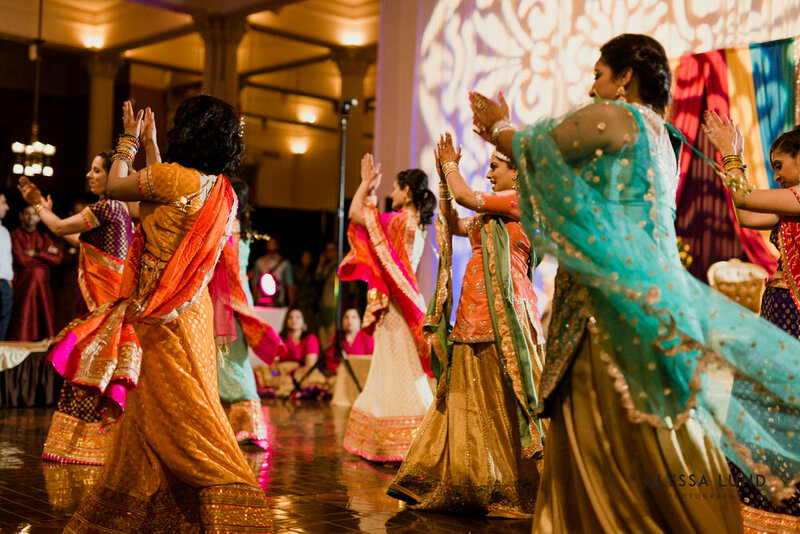 A lovely focal point was a stage set up with a really vibrant backdrop of draped fabrics and gold, elegant chairs. 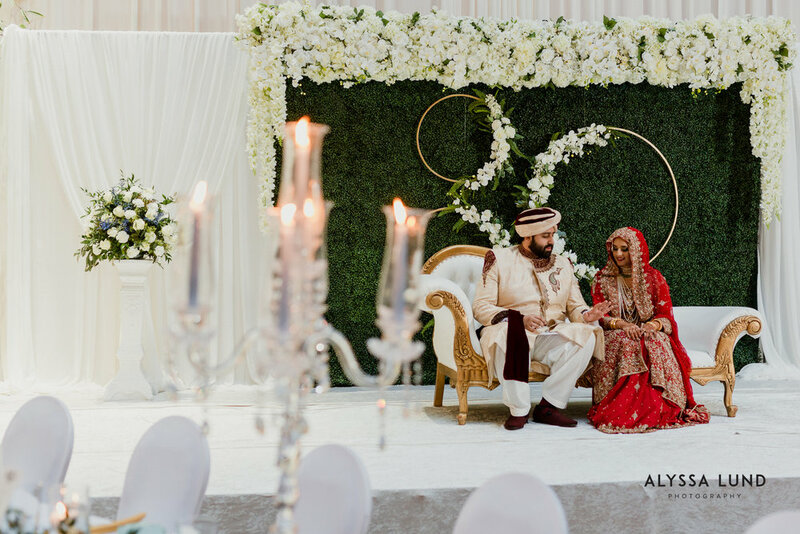 The folks behind Noor Design & Decor and Events by Nisar did really beautiful, intentional work with the space and event logistics. I dove into capturing candid and documentary photos of entrances, performances, and dances by Nadia and Sal’s friends and family. For a portion of the night Nadia and Sal sat on the stage while their families came up to offer blessings. Friday night held so much excitement and was a big happy party, with dancing filling the later hours. I loved seeing Nadia and Sal’s personalities together; Sal was a ball full of the happiest energy and Nadia was calm and balanced, constantly smiling. My heart melts at these sweet pictures of them dancing together and embracing the magic of their wedding celebration. 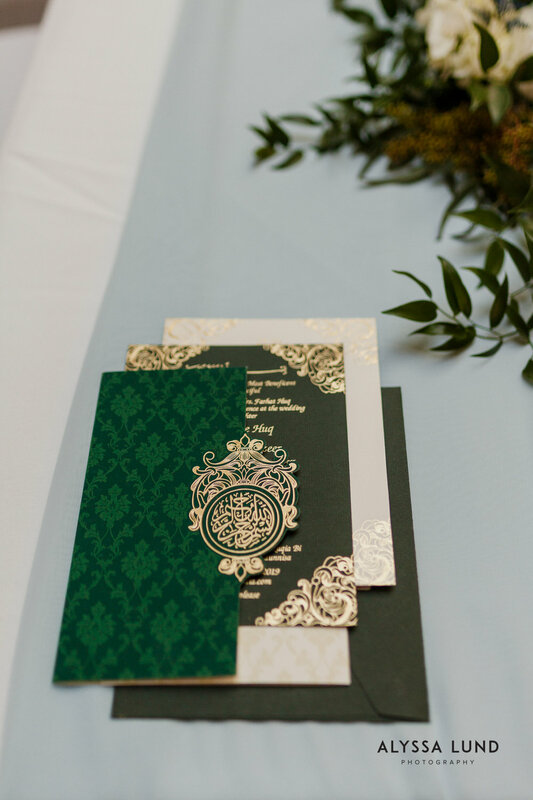 On Saturday we were back at the Landmark Center During the beginning of the day, I focused on detail photos of Nadia and Sal’s invitation suite (the gold foiling was incredible!) and getting ready portraits while Mustache Artistry styled Nadia’s hair and makeup. 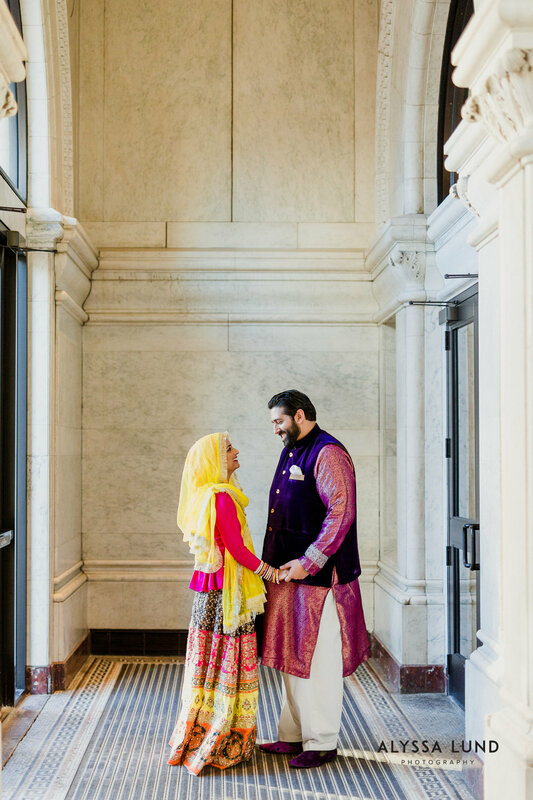 As guests arrived and the festivities of the day began, I took portraits of Nadia and Sal around the Landmark Center. 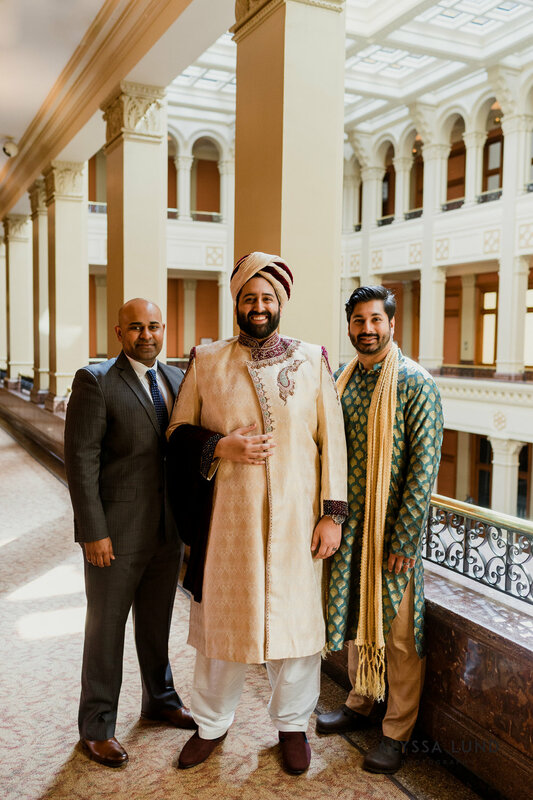 When they first visited the venue, they were struck by the incredible architecture, symmetry, and sense of grandeur, and I really wanted to convey that sense of place in some of their portraits. Their venue choice was the perfect backdrop for them. On Saturday, in the middle of their couple portraits, Nadia and Sal one of my all-time favorite wedding decisions: they took a pizza break in the middle of their pictures. They were both getting hungry (it can be difficult to get food during a wedding day), so they talked with me about sneaking away during their portraits for pizza and I have never been so happy. 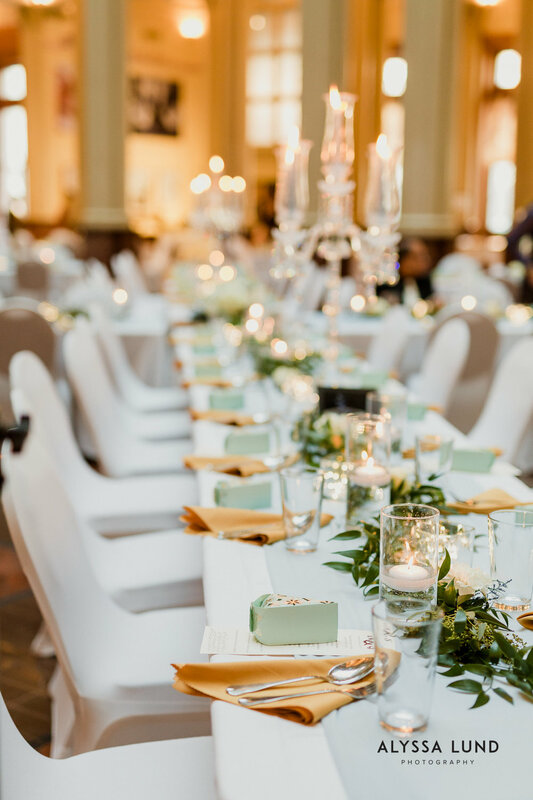 If you don’t know, Tyler and I share an epic love for pizza (plus, I’ll always support keeping my couples well hydrated and fed throughout wedding days). Tyler ran out and got a few slices from a local pizza parlor, and we pulled out a couple of chairs onto the backside of the landmark center where they sat near these stone steps and had a pizza break. The three of us reflected on the excellent contrast between their very formal outfits and their casual grins while they dove into these steaming slices of cheese pizza. . I love that this little spontaneous idea brought them so much joy, I love that they got to have full bellies before their big party, and I love that this gave Nadia and Sal a chance to pause from all the grandeur and elegance of their wedding and just chill out and share a calm moment together. The quiet moments of them being themselves, happily chowing on pizza, balanced so well with the other high-energy, community-filled moments of their wedding. During cocktail hour and entrances, Andrea Stern played the harp and there was a religious reading. Another stunning stage setup held a seating area with a couch and was decorated with greenery, flowers, and geometric circles for more formal portraits. 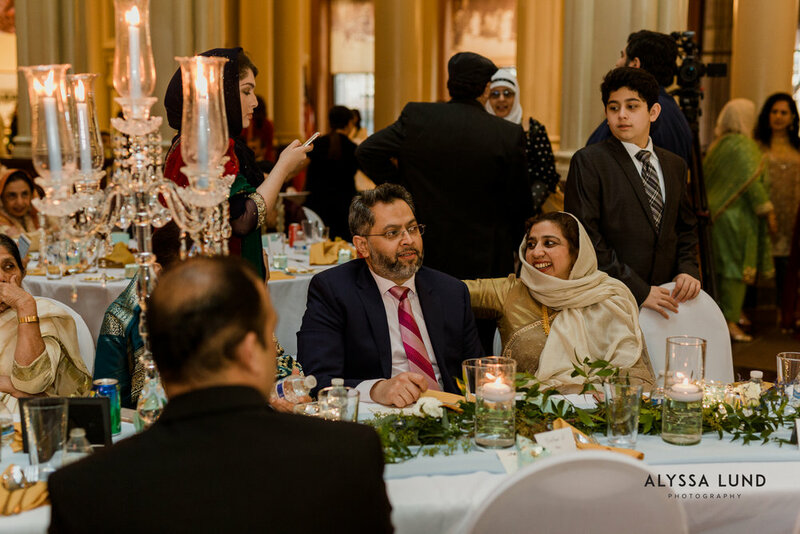 Nadia and Sal’s families sat at long tables in an x-shaped formation while surrounding round tables hosted their other guests for dinner catered by India Palace. 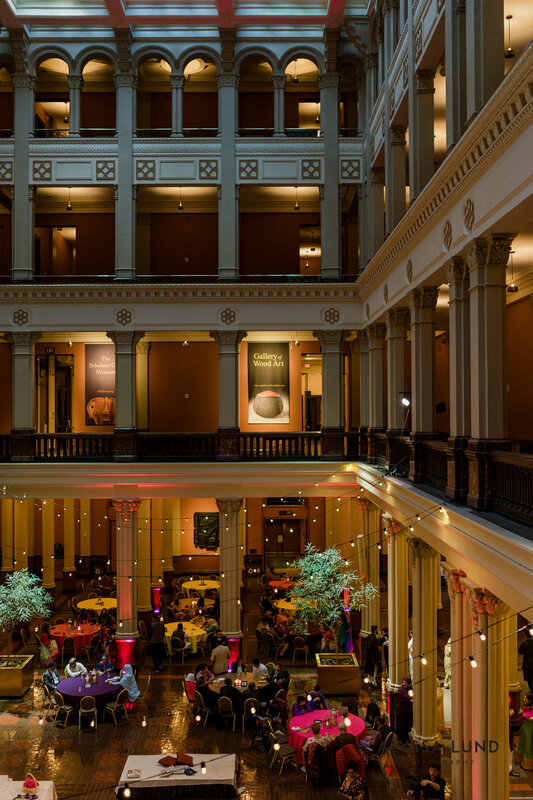 Soft, elegant music performed by Loring String Quartet accompanied dinner and conversation before Nadia’s delicious almond and passion fruit flavored macarons from Nikkolette’s Macroons came out for dessert. At the very end of the night, Nadia had her Ruksathi send-off with her family. Nadia’s family escorted her out and surrounded her and Sal in a swirl of hugs, kisses, and personal moments before they got in their car and drove away. Nadia and Sal, thank you for trusting me to document your wedding. I have so loved getting to know you both, and seeing all your ideas brought to life was magical! It was truly an honor for Tyler and I to be a part of your celebration - thanks to you and your families and friends for helping us feel so welcome and bringing us in to so many beautiful moments. Thank you, especially, for the chillest, happiest pizza photo-break ever. <3 Congratulations to you both!! 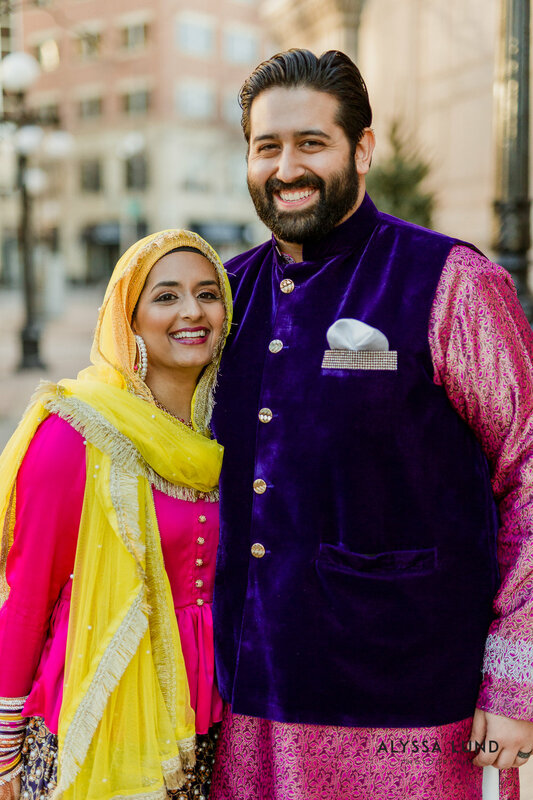 A big thank-you also goes out to all the other vendors who brought Nadia and Sal’s day to life!